This rack is designed to hold 3 string trimmers. Fully lockable and comes with 3 keyed-a-like locks to help prevent theft. Trimmers sit horizontally in hooks and secure with lockable hasps. Per the manufacturer: This sturdy, steel rack mounts securely to the wall of your enclosed trailer. Assemble towers with the hooks and rests according to directions. 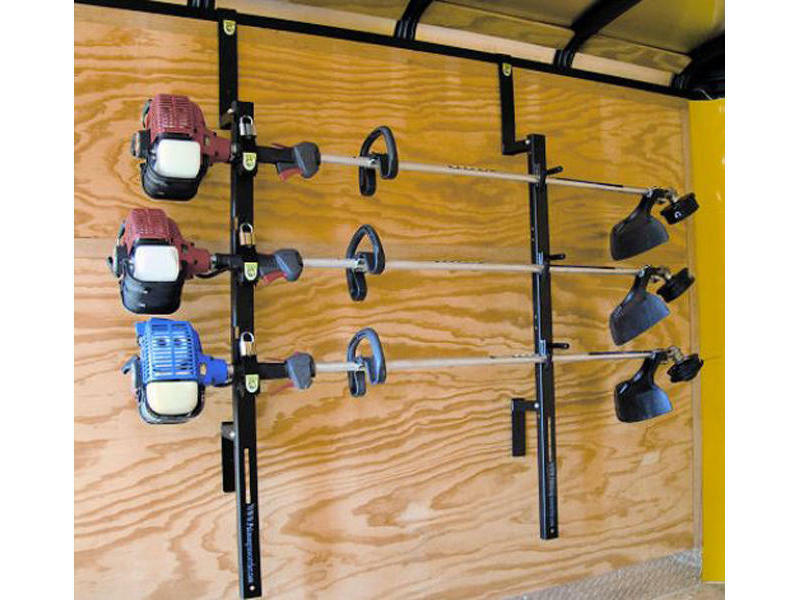 Determine where on your trailer wall to place the racks. Towers should be approximately 3 feet apart. Hang the towers with the hooks, then screw them to the wall using self tapping screws (not included) in the pre-drilled holes. To use the rack, simply place your trimmers horizontally in the hooks. Hooks on one of the towers have integrated steel hasps. To secure your trimmers in the rack, just fold the hasps over each trimmer and lock in place with the included locks. Racks hook over the steel header at the top of the wall of your enclosed trailer. Constructed of sturdy steel with a hammer gray and black powder coat finish for corrosion resistance.